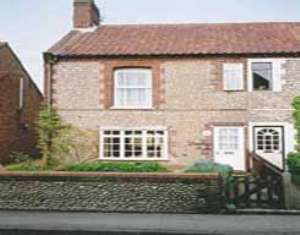 Sheringham has a wide range of amenities with indoor leisure pool, tennis courts, golf courses, Blue Flag beach, the 'Little Theatre' and Poppy Steam Railway line running along the coast to Holt. Bird watchers and walkers alike will be delighted by the quaint coastal villages and salt marshes around Blakeney. The seaside town of Cromer, famous for its crabs, 6miles. Norfolk's NT Houses and Parks within a 30mile radius. Shops and pubs a few minutes walk. Ground floor: Lounge/dining room, step up to kitchen. Steep stairs to first floor: 2 bedrooms - 1 double, 1 twin, additional Z-bed (suitable for 1 adult, alternative sleeping only), bathroom with toilet. Services: Gas fire. NSH. All power & bed linen (duvets) inc. Portable TV. Video. Gas cooker. F/freezer. M/wave. W/machine. Small garden with furniture. Unfenced stream in garden, children must be supervised. Non smokers only.